Alexander Wang first launched the collaboration with H&M at the Coachella festival back in April, and ever since then fashionistas have been trying to catch a glimpse of the designs and even get their hands on the clothes. 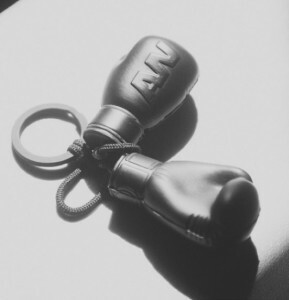 Back in July H&M first teased the public by virtually releasing the look book on Instagram showing only a mini boxing glove keyring and a punch bag. Now that the full collection will be released at H&M on the 6th of November it is very clear to see that the sports luxe trend is still alive. Rihanna was the first celebrity seen wearing the collection two months before it hit stores, the singer was photographed in New York wearing the grey Wang branded leggings and matching long sleeved crop top. The collection includes scuba dresses, thick grey jumpers, mesh panelled leggings, cropped bra tops, leather joggers and parkas. 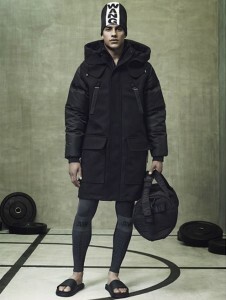 Their accessories include gloves, beanies and duffel bags all branded Wang of course.